Tin solder is a fast growing and the major end-use sector now accounting for the largest percentage of global demand for tin. The demand for tin solder is driven by substitution for lead solder and continuing growth in demand for consumer electronics. Tinplate remains an important end-use of the market as well as chemical additives used in the textile and manufacturing sector. The New England, Bourke and Broken Hills districts of NSW have had tin mining present since the beginning of the 20th century that supplied local and overseas markets. 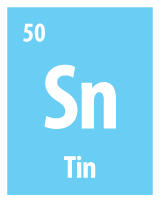 NSW is still very prospective for tin. Read more about Tin [3.7 MB] mineralogy and prospectivity in NSW. The Gibsonvale, Ardlethan and Emmaville districts in NSW have been important producers of tin and remain prospective areas. Aurelia Metals Ltd's Doradilla Project near Bourke in far western NSW, represents a large and strategic tin project for the company. Aurelia Metals has also reviewed the historic large scale mining and treatment of alluvial tin at Tallebung and has identified the potential for significant tin mineralisation within the remnant tailings and crush oversize dumps. AusTinMining's Taronga Tin Project near Emmaville in NSW is focused on the development and discovery and development of tin and nickel-cobalt mineral deposits. Australian Tin Resources Pty Ltd's Ardlethan Tin Mine is located approx 560km southwest of Sydney, NSW. Advances in processing methods and increased current tin prices, have created the catalyst to recommence operations. Gibsonvale Alluvials Pty Ltd is the holder of mining leases for the Gibsonvale Tin Mine. A small quantity of tin is being mined from the site.